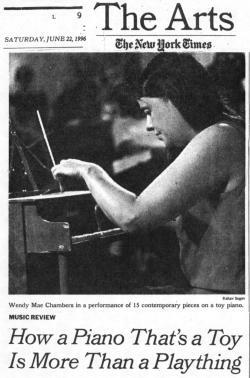 According to the NY Times, Wendy Mae Chambers “is possibly the world’s foremost virtuoso of the toy piano”. 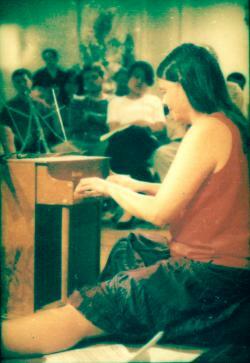 She began playing the toy piano in 1978 when she performed the “real” piano, as well as the toy piano, in George Crumb’s “Ancient Voices of Children”. 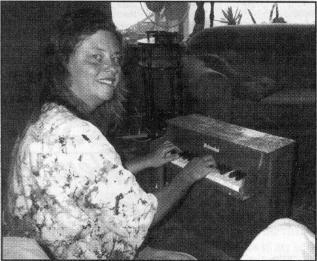 She composed her own “Suite for Toy Piano” in 1983 to enable her to perform in venues which did not have a piano. In 1990 she gave her official NYC debut recital at the Knitting Factory. She has commissioned numerous composers from NYC and New Orleans to create pieces for her. 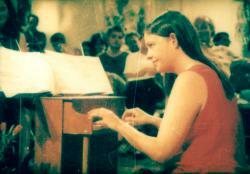 She performs the first toy piano piece ever written (1948), “Suite for Toy Piano”, by John Cage. As a toy pianist, she has appeared on National Public Radio, New Sounds on WNYC radio, BBC-TV, Nickelodeon’s Nick News, New Jersey Talking-Channel 12 TV, WWL-TV in New Orleans, and CNN. Her appearances in NYC have included a benefit at the Guggenheim Museum where her performance was covered in the NY TIMES society page, the NY Historical Society, clubs and art galleries! She has performed at the Edinburgh Fringe Festival in Scotland and a TOY PIANO CONVENTION in Cedar Rapids, Iowa. She has made numerous performances in New Orleans including radio performances on WTUL, WWNO and WWOZ. Her New Orleans debut was in 1996. Ms. Chambers is the official endorser of Schoenhut Toy Pianos. Her two new toy piano pieces are Mandala for Toy Piano in 5 movements and Music for Toy Piano(s) and Hamster(s) for 4’33” (formerly titled “Sonatina for Toy Piano and Hamster(s)). These were premiered at HERE in NYC on August 14, 1998.